Even though eczema appears as a skin rash, it is considered to be an internal disharmony. Although three-quarters of all eczema cases are linked to irritant exposure. That means something the skin is coming in contact with is causing the condition. Other factors for the condition may be genetic, allergies, diet and weather. This formula was designed specifically for psoriasis, eczema, and other obstinate forms of dermatitis, using a combination of the two herbs, Myrrh gum, and Goldenseal root extract. These in combination may help to renew and heal many skin disorders. This is good news, particularly as conventional medicine has very little to offer sufferers for alleviating symptoms of this condition. The formula also addresses other skin disorders, such as open sores, ulcer, and varicose veins. It is to be used both internally and topically. The therapeutic properties of Myrrh gum extract are anti-inflammatory, antimicrobial, anti-catarrhal, antiseptic, astringent, balsamic, fungicidal, digestive, stomachic, tonic and vulnerary, to name a few. Used externally, amazing results are achieved in the treatment of chronic wounds and ulcers. It accelerates healing of athlete's foot, as well as weeping eczema. Bed sores deeply chapped and cracked skin, boils, carbuncles, acne and other skin ailments have shown that Myrrh gum in cream, salve or oil carrier can be applied directly to these conditions. 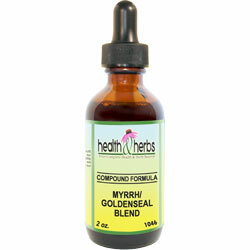 When Myrrh gum tincture is taken in the recommended dosage, it can help in the treatment of many problems. It has been taken internally for the treatment of stomach problems and chest ailments and is used widely for the treatment of mouth related problems. Native American tribes used Goldenseal root as a medication for treating inflammatory conditions, including skin problems and digestive disorders. Cleansing, health-defending Goldenseal extract is used for a wide variety of conditions, including peptic ulcers, colitis, urinary tract irritation, constipation, poor appetite, ringing in the ears, tuberculosis, cancer and other ailments. Today, the roots and rootstock are widely used in herbal medicine, particularly as an herbal antibiotic and immune system enhancer. Berberine, a chemical contained in Goldenseal, is said to fight off infection caused by some bacteria, fungi, and yeast and can act as a mild sedative. Berberine, found in Goldenseal kills numerous forms of bacteria on contact and research has found that it is most useful when applied in a salve directly to wounds, herpes sores, dermatitis, eczema and other conditions of the skin. Ingredients: Myrrh gum, Goldenseal root, Structured Water, 20% Alcohol. Non-Alcohol: Myrrh gum, Goldenseal root, Structured Water, Vegetable Glycerin. Instructions: May be used internally or topically. Use 20-40 drops every half hour for a full day if needed. When the skin shows improvement use a maintenance dose of 6-12 drops, 3 times per day, in juice, water, tea, or under the tongue and discontinue after 7-10 days, to give the body time to rebuild good bacteria. Shake well. Store in cool, dark place. Keep out of reach of children.